The outer shell of this Parkinsonia Ammonite has been polished away to reveal the delicate intricacies of the suture lines dividing it into chambers. 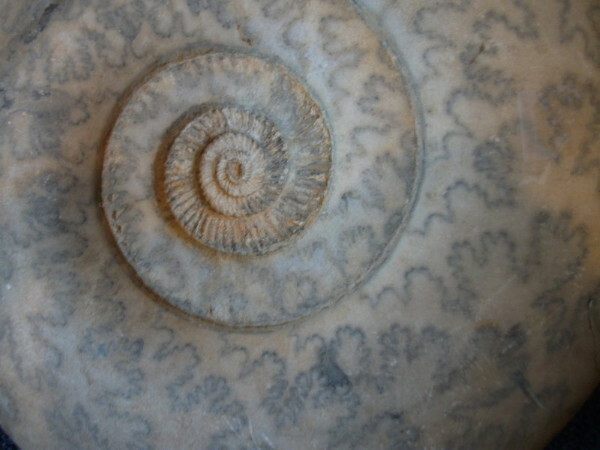 The spiral has always been a fascinating occurrence in natural forms. Those of you with naughty dogs at home will relate to this! 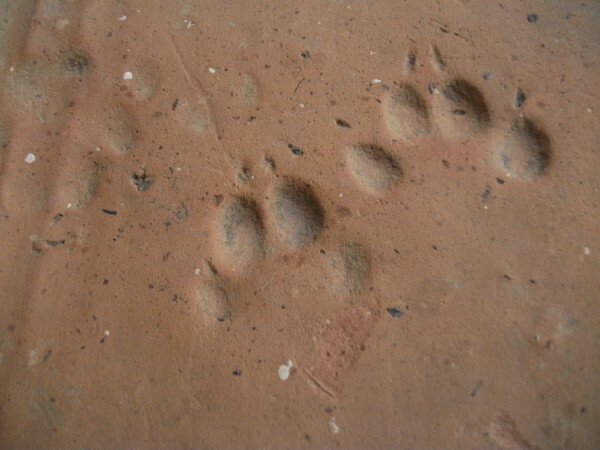 A Roman roof-tile, possibly from Lenthay or Thornford, has met with a slight accident. Truly, as one volunteer put it, a case of Cave Canem. 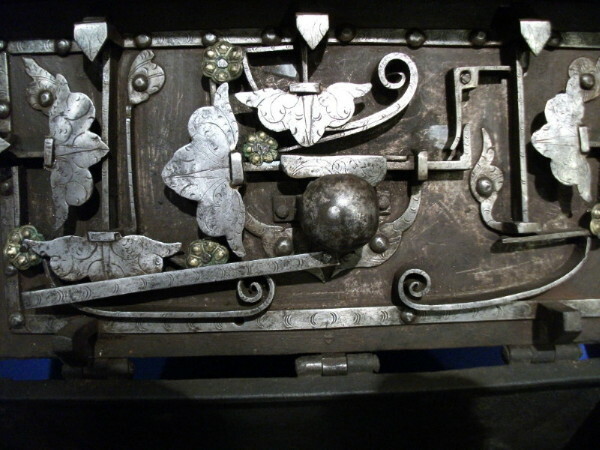 The inside lid of this seventeenth century puzzle-lock strong-box, designed after a Nuremburg model, reminds me of a poem with a particularly complex rhyming scheme. Possibly one of the safest ways to keep your savings these days! My favourite painting from the whole series of Diana Ruth Wilson's water colours. 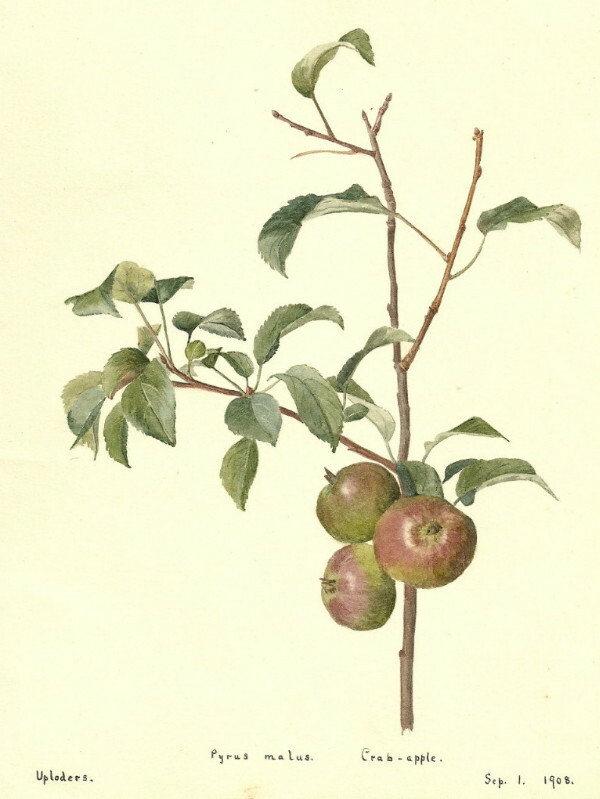 A visitor recently remarked: 'You could pick that apple right off the page. It would have a glorious taste, if a trifle tart'. Some ordinary objects hold a simple aesthetic appeal, which this Owl Jar perfectly illustrates. 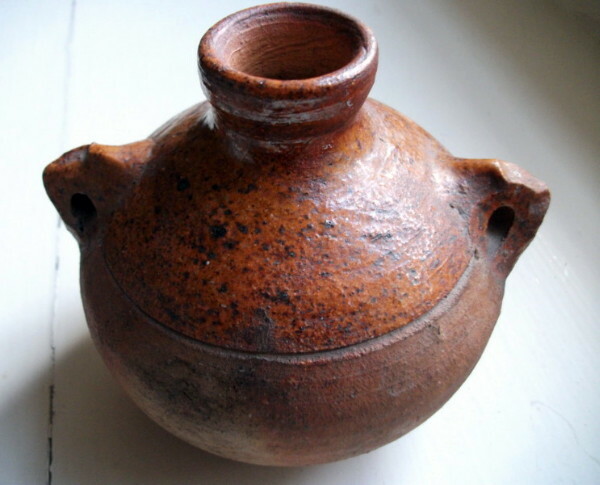 Made of earthenware with a lead glaze on its upper half, it is one of the earliest (and rarest) types of vessels for carrying cider out into the fields when labouring, worn round the neck on a thong. Welcome refreshment when water was not so hygienic [reserve collection]. Scarily beautiful or beautifully scary? 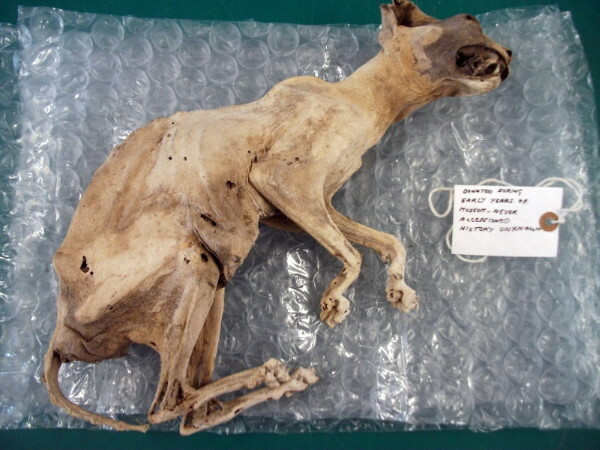 This cat, now "mummified", was found in the roof-space of a local barn. Did it die of natural causes, or was it deliberately placed, as some think, to ward off evil? This unprepossessing stone has a story to tell. 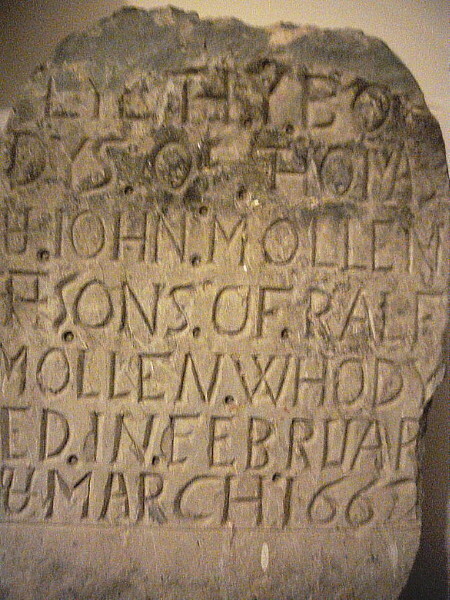 The memorial to Thomas and John Mollen who died in February and March 1662 respectively, it was discovered built into a wall when the old Police Station in Digby Road was demolished. It is possible that the Mollens were victims of the Plague that was rife at the time and were therefore buried with others in a plague pit situated where the Yeatman Hospital now stands. A pipe for the serious smoker! 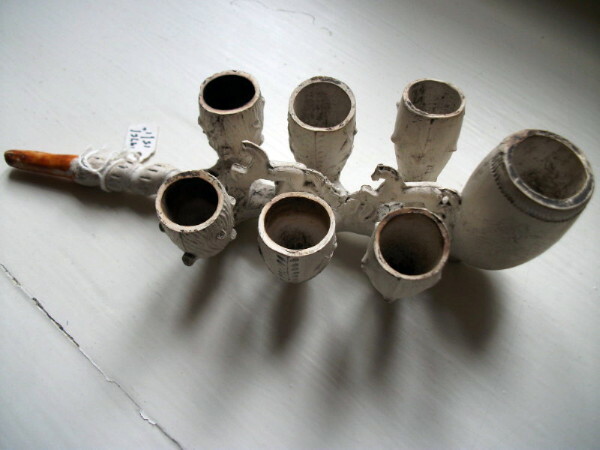 With seven bowls, a horn mouthpiece and a twisted stem; you can just make out two galloping horses along the central line. A reminder of Walter Raleigh's residency in the town [reserve collection]. This little wooden object had me mystified - until I discovered it was a nifty kitchen gadget for putting the crosses onto hot cross buns! [reserve collection]. 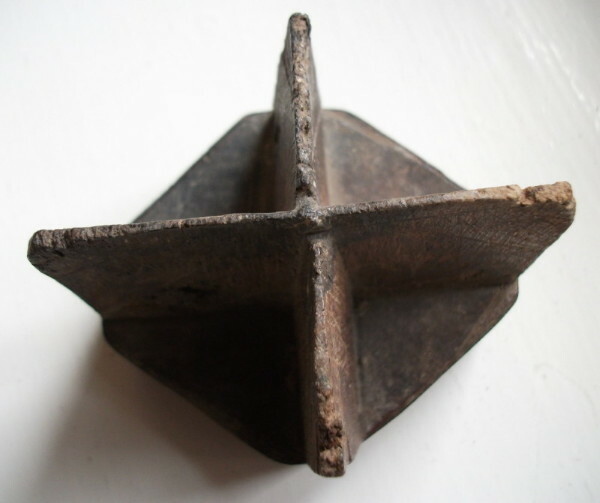 Not one object but part of a small assemblage donated by developers of the property formerly known as The Antelope, one of the town's major coaching-inns. 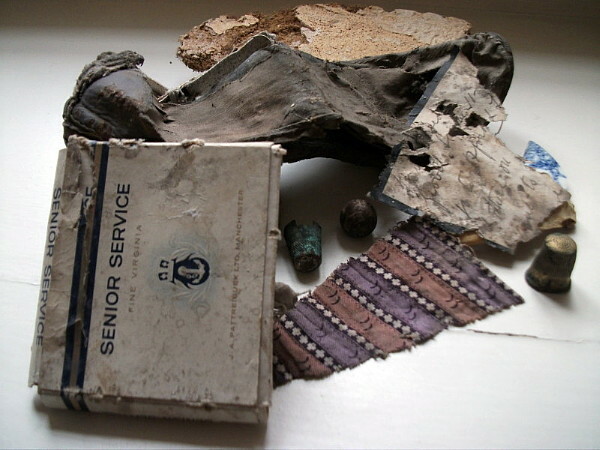 A lost shoe, discarded cigarette-box, wall-fragment, a marble, a torn letter, fractured china and a thimble stained with verdigris may seem like rubbish but they still resonate with the ghosts of past lives [reserve collection]. WHAT WILL BE YOUR FAVOURITE OBJECT?